I love the concept behind this bit of marriage/relationship advice, but the problem is that it’s, ultimately, just a metaphor; a couple can try to act as one flesh, but they’ll always be two different people with two very different sets of needs, and that can be a difficult thing to reconcile. In any close relationship the pressure to be on the same page at all times is great, and the temptation to try to control one another in order to reach that point can be even greater. Ultimately, though, you can’t control people, and especially not the people you love, no matter how close you are. That’s the lesson Clark learns in Action Comics 1004. 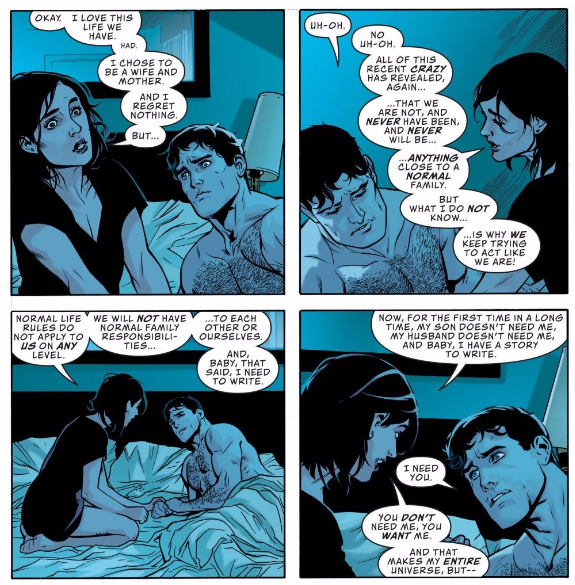 Brian Michael Bendis and Ryan Sook devote a good portion of the issue to the reunion of Clark Kent and Lois Lane, and it’s in these sequences that the book sings. Bendis and Sook create a natural, electric chemistry between the two that shows why they absolutely belong together, making their separation feel all the more terrifying in the process. Thankfully, Lois and Clark are still a couple, and still as in love as ever; Lois just needs a little time alone to work for a bit. To be completely honest, I don’t fully understand why Lois needs to live separately from Clark in order to write, and I’m not sure Clark does either, but what’s important is that he respects her needs, respects her decision, nonetheless. He asks her to come home at first, sure, but he doesn’t press her or try to force it, because it would only sow resentment. A large part of why he fell in love with Lois in the first place is because she’s driven and independent, because nobody can make Lois Lane do anything she doesn’t want to, so what would it say if Clark, of all people, started pressuring her? Because he loves her, he has to give her space to be who she is. The futility and limits of trying to control people actually recurs throughout Action Comics 1004 as well, although it manifests in different ways depending on the relationships in question. As the boss, Perry White has the authority to make at least some demands, to retain some control over his newsroom, but he’s still dealing with an entire building of individuals all with minds of their own; his control only extends so far. 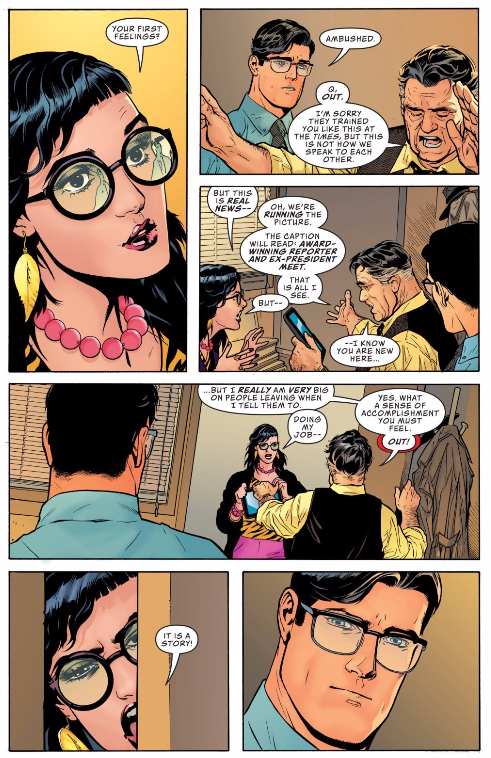 Actually, nobody has any control in this situation; Trish desperately wants Clark to cooperate on this story and he won’t budge, Perry only gets Trish to leave after she’s already harassed and harangued Clark, and Clark has no control over how Perry handles a story that’s incredibly personal to him. Only Perry’s authority as boss eventually gets Trish out the door, but it’s not without a struggle. Even an employer can only control his employees so much. Superman, though, has more authority than just about anyone, so it’s no surprise that the staff of the Daily Planet snap to attention when he shows up; they follow his lead without even thinking about it. His ability to control the situation, though, isn’t wholly a good thing. Why was Copperhead attacking the Daily Planet? We don’t know, and Superman took such complete control of the situation that he never even considered finding out. Maybe Copperhead’s motives don’t matter (and protecting innocents will always be Supes’ priority), but it’s possible she may have helped uncover a deeper conspiracy, perhaps even shed light on this arc’s villains, the Invisible Mafia, if given the chance to monologue for even a few more seconds. Clark’s going to need his reporter skills more than his superpowers to take the Mafia down, and that’s going to mean easing back a bit and letting clues reveal themselves in their own time. As always, attempting to control people, or even situations, is a move that has severe limits and downsides. Okay, so, I loved this issue, but it does fit a bit awkwardly in the ongoing story: The Invisible Mafia doesn’t actually appear, but there’s these small references to them from Goode and Perry just to remind readers that the story is still going, but it ultimately felt a bit distracting to me. If we were going to take a month away from them to dig into Lois and Clark, I’d rather Bendis have committed to it.